If I hold 5 spanish ships and 4 english ships, do i get +2? Or does it have to be same side? Nola_Lifer wrote: If I hold 5 spanish ships and 4 english ships, do i get +2? Or does it have to be same side? Are traditional values still held; 4 for 12 terts, 5 for 15 terts? If you mean the default values in the game engine - yes. To answer you point before that however, yes, those ships for the 9 for +2 bonus would have to be one the same side - I will notate that on the map. What about no default setting and having some sort of bonus with the single ships? It would give more importance to your treasury and mimic real life. More money you have the more ships you can get. Ah, that is the basis of the map...building up the treasury to ensure you can pay for the navy. Yes it is possible to have no default settings, but i though the +2 for 9 ships on each side covered your suggestion? I did another check wiht the proper xml 888s to see how this will look. I think it looks more spacious than Beehive, and yes writting the xml shows the challenges in this form. However, i cannot think of another way to present this map...at present. Would someone please move this map back into the scrap bin. Lack of interest is shown here probably due to the nature of the game board being too intense, even though the graphics were establish themselves. Sorry guys. Someone else can do this is they have better ideas. I have come up with a way in which to make this map look great, and without the battleship grid. I prefer real names over coordinates, myself. Victor Sullivan wrote: I prefer real names over coordinates, myself. yep, real names or even acronyms are far better. alphanumeric labelling is monotonous and is one of the main causes of missdeployment or name confusion related mistakes. no lines...no grids...i'll next update it when i have everything on it and the legend co-ordinated with the map. Interesting but what about hexes, like King's Court? Nola_Lifer wrote: Interesting but what about hexes, like King's Court? Mmm. i'm not totally in favour of using all hexes; i've used double hexes in Actium and now have some used in here for major english vessels...using the odd shaped pieces allows ship names to be inserted whereas the hexes are a bit limited in that respect. Does the draft have to be gone for the vacation? ViperOverLord wrote: Does the draft have to be gone for the vacation? Sorry ViperOverLord, not sure what you are asking here? 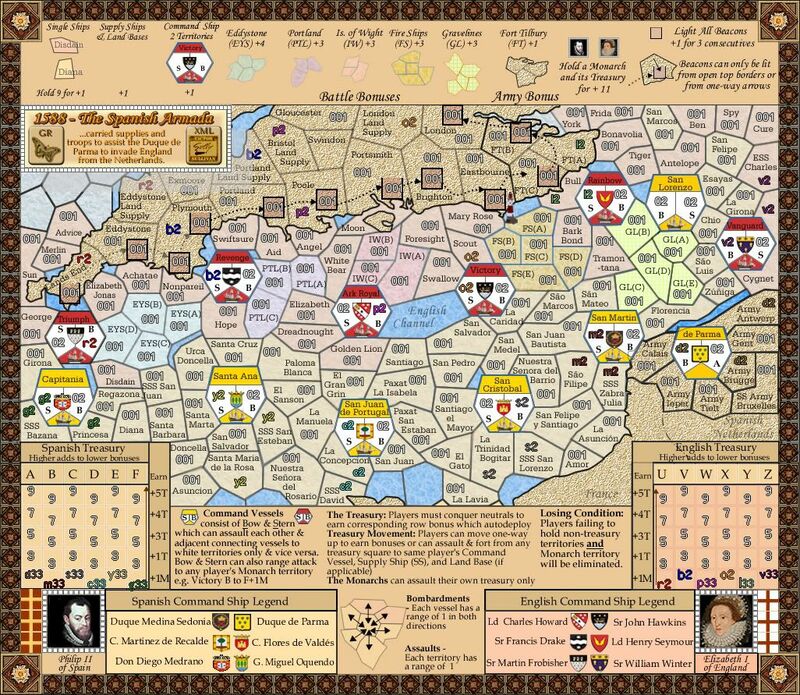 I have asked tnb80 to make this maps' status on vacation rather than abandoned, and am working on a new "centrepiece map design" in spare time....i hope to bring it back into the forum after mid-June. I mean I can't see any of your prior versions. It says they were removed from Photobucket or something like that when I click the links. Yes, i removed them, because i thought i wasn't going to use them. I have re-posted Versions 2,5,7 & 9 on the front page. The new version 10 when it comes out will be a completely different design, hence there may be some alterations to some small aspects of gameplay. Last edited by cairnswk on Sun May 20, 2012 4:06 pm, edited 2 times in total. 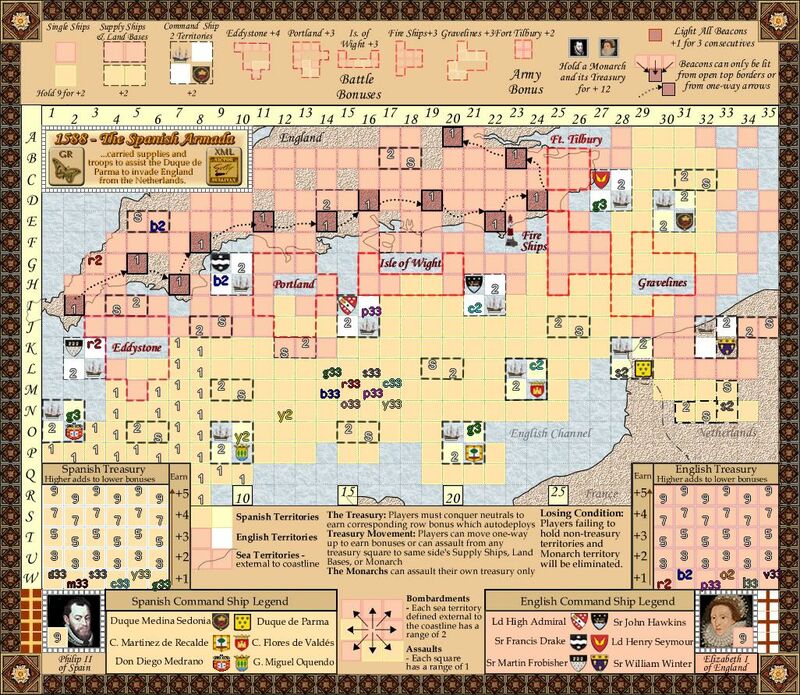 Re: [Abandoned] - 1588 Spanish Armada - V10-P7 Gameplay? The front page has been re-organised to start a new round of discussion for this map. I must say cairns, this version is a whole lot easier to follow than the previous versions!! I gather then that you are for sure working on this? Let me know, and I'll get it moved back into the Main Foundry for you! !